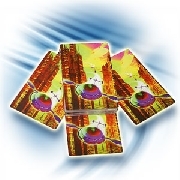 Make choose three cards, put them back in the deck and place the deck on the palm of your hand. Concentrate and after a minute you will find the three cards in a unusual way. Indeed, a mysterious force will move the deck in three different directions and three cards will come out of it. Of course they will be the three chosen cards! • The cards are bridge size. Αυτό το προϊόν προστέθηκε στον κατάλογό μας την Friday 20 September, 2013.